High-performance and durability are two words that can characterize Smittybilt 97495 XRC Winch best. The American company Smittybilt exists since 1956 and produces equipment for trucks and SUVs. Smittybilt winches are created for heavy operating conditions and are distinguished by high quality and unique durability. If you have decided to get a winch but still don’t know which one to pick up, this review is for you. Consider the major benefits it can offer you and take the well-informed decision based on the careful investigation of the winch characteristics. Let’s get started! Cable 94′ Length 5/16″ Diameter. If you were careful when having a look at the features, you could notice that winches of XRC series have water protection class IP67. This feature provides you with the great chance to use it under any conditions. Due to the powerful motor and not large gear ratio, the gearbox has a high winding speed. The case of the winch is covered with a strong, UV-resistant coating, which is also an important feature to take into account when looking for the perfect winch for your vehicle. What Makes Smittybilt 97495 a Good Winch to Choose? 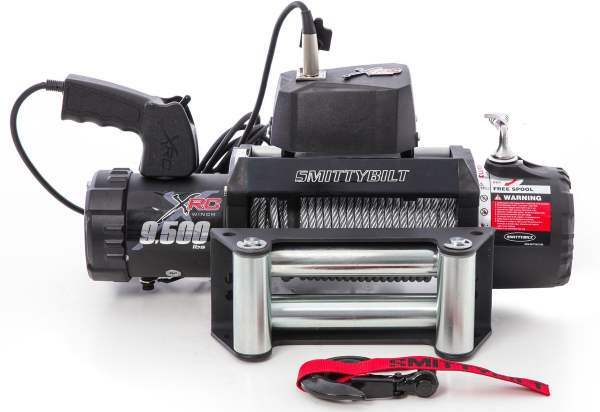 If you are thinking whether Smittybilt winch is worth your money or not, you should keep in mind that it is made by the well-known producer who provides you with many pros and guarantees. This model refers to the improved generation of winches that have been successfully improved. You can rely on your winch in any trouble you face unexpectedly. It is going to work for years. If not, then you can have it fixed due to the warranty provided for the lifetime. This refers to the mechanical warranty while the electrical is five years, which is also long enough. The brand has few competitors only, being one of the best producers of the high-quality winches. Your Jeep will look much better if you get this device. It is not only about the stylish look but about the benefit it can provide you with helping to deal with the off-road issues quickly and effectively. There is a great saying “Be better than you were yesterday”. This is the main principle of Smittybilt work. The designers always brainstorm ideas on how to improve both the appearance and the internal organization of their winches. If you see Smittybilt winches once, you will be able to differentiate between them. The model 97495 xrc has a bumper and armor that aren’t similar to any other. Smittybilt xrs series is the best choice for the money. 9500 pounds of its pulling power will be enough to pull your Jeep out from any mud, regardless of weather conditions. Don’t forget that it is waterproof, which will definitely be of use to you as there is water in any mud hole. You won’t have to worry being sunk deep as Smittybilt is the winch you can rely on facing emergencies. There are a lot of drivers who proves that the winch from Smittybilt does its work flawlessly. You won’t face difficulties when installing it. It will look great on your 4×4 or Jeep. The installation won’t take much time thanks to the understandable instructions that are included to help you mount the winch. Super quality of winch parts, durability and power make this device a pretty good choice among winches of the same price range.